Meet mysterious creatures of the ocean! 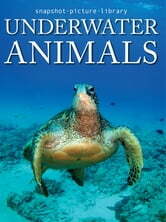 Accompanied by a read-along audio track, more than 70 colorful photos showcase all kinds of underwater animals. Discover these wild, wonderful, and sometimes weird animals, who live in a colorful world without humans. Stunning photos introduce creatures large and small, each with its own special place in the depths of the sea. Snapshot Picture Library books include a read-along feature: Children can read along with an audio track, following the highlighted words on each page. Perfect for pre-readers and early readers! Kids will enjoy learning fun facts about underwater animals, and the more than 70 beautiful color photographs will delight anyone who loves animals, especially toddlers, preschoolers, and elementary-school children.